Do you take commissions? How can I order something? Yes! Please visit our Inquiry Page to request a custom quote for your next dream gown, outfit, costume, or corset! Prices can vary significantly depending what you are looking for. Custom fitted corsets typically start at $300 and increase depending on detail level and fabrics. Full costumes and very detailed gowns start at $1000 and increase depending on complexity and materials. Less intricate pieces and accessories can be under $100 to over $500. Our payment plans allow us to work with your budget on the timeline that works for you. Yes! We work with payment plans of 2 or more installments for most large orders. Does this come in my size? Do you make plus sizes? Yes! Every garment is made to order and tailored specifically to fit your measurements for a truly personalized experience. Daisy has a background working with all types of body shapes and sizes and will be happy to make your dreams come true in any size. Please visit our Customer Testimonials page for reviews written by customers of all sizes! Most orders take between 1-4 months for production. Can I model for you or collaborate on a project? I am always open to ideas for collaboration. Please email daisy@daisyviktoria.com and let me know what you have in mind! How do I measure myself for my custom gown or corset? To get the best measurements, we recommend having a local tailor or a trustworthy friend to help you. We will ask for measurements based on this reference chart. 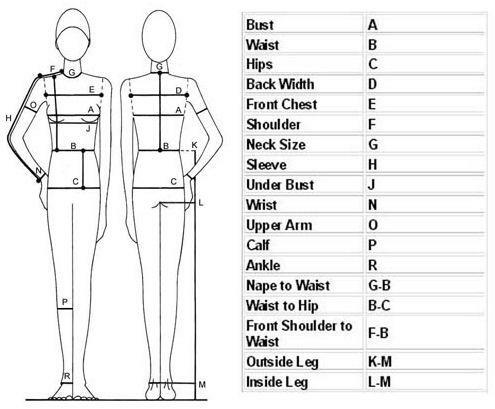 We may ask for variations on measurements, depending on your specific garments. If you trust yourself to take your own measurements or have a friend to help you, we have created a video tutorial to help you find and take these measurements. Do I need a flexible tape measure to measure myself?